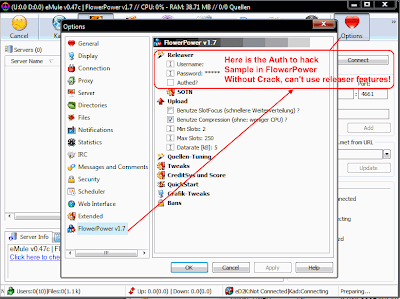 Here some Hackme and Crackme eMule AJ Mods that need to Crack again. People want to share on ed2k with all Features enabled! - Server Auth check by login to enable releaser features need to crack (bypass auth check to allow everyone the use of releaser mod features) // it is also much safer to not use server and login because of server ip logs! - If possible the Ratio can get removed, see wyx crack for official bin // to allow PSTN line speed user to use emule too. Thats 33.6k, 44k, 56k Modems Dial up, GPRS,... in some countries its 64k - 128kb/s and below ISDN like speed with ADSL (cleaner lines) low upstream. - eXe Protection: none, but Binary emule.exe files are hexedit protectet from changes on several parts. - Is it legit to crack emule: Yes 100%, this mods don't have source codes available GNU/GPL otherwise we dont need to hack it and compile it how everyone likes it. old crack and auth bypass don't work anymore sometimes. please submit hacked emule.exe cracked files or patchers/cracks,... here files. Schade scheinbar, ist wohl keiner dabei der das machen kann, kein einziger kommentar dazu..
Vermute das es einige versucht haben doch niemand schaft das. Mein Auth bypass Tool funktioniert doch nocht gut? Ich habe es bei Fireball, RC-Atlantis und EPB getestet. Komisch das es bei euch scheinbar nicht funktioniert. Mit dem Supersource Finder ist immer so doof, weil ich es nicht schaffe auf einen emule server zu connecten. Naja wenn mir jemand einen guten Server gibt der funzt, dann wäre das auch kein Problem. wenn ich lugdunum 17.15 fuer windows drauf mache mit nem adsl modem wird das gehen als server von aussen?